Architect Celine Condorelli provides a framework in which the participants explore forms of communication with written and printed matter. The installation takes the form of an archive and charts the move from typographic experiment to a focus in the role of books in their artistic and architectural practices. Dustin Ericksen; Simons Not In The Show [after Mitchell Syrop], 2005. Vinyl. Dustin Ericksen; Participants, 2005. Vinyl. 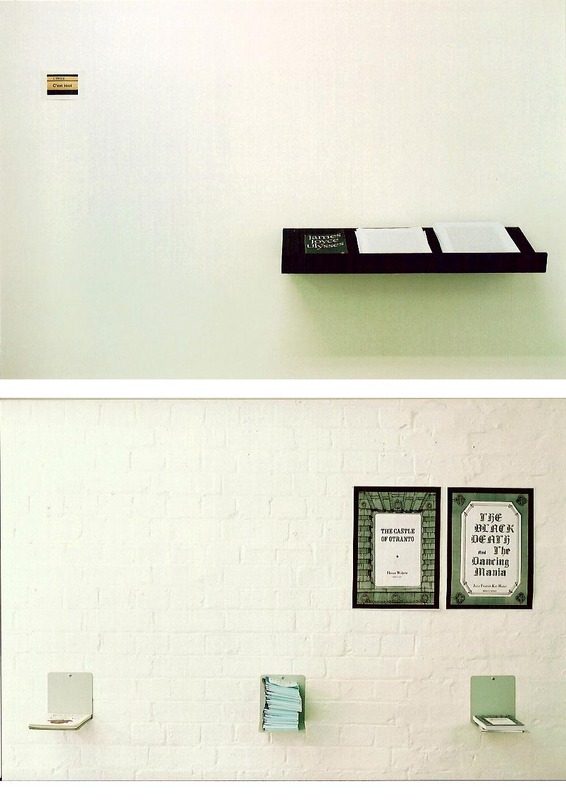 Pablo Bronstein; Posters used at bookstand, 2005. Dustin Ericksen; Simian's Way, 2003. Ed.500 + 40 Artist Proofs. Dustin Ericksen; All The Signs, 2001. Ed. 5 + 1 Artist Proof. Simon Popper; L'Image C'est Tout, 2001. Colour photograph. Simon Popper; Concordants, after 1922 Paris Shakespeare. Proof copy. Ed.26 + 5 Artist Proofs. MDF Cutting Schedule, 2005. Print. Dustin Ericksen; Participants , 2005. Vinyl, Concrete, Perspex. 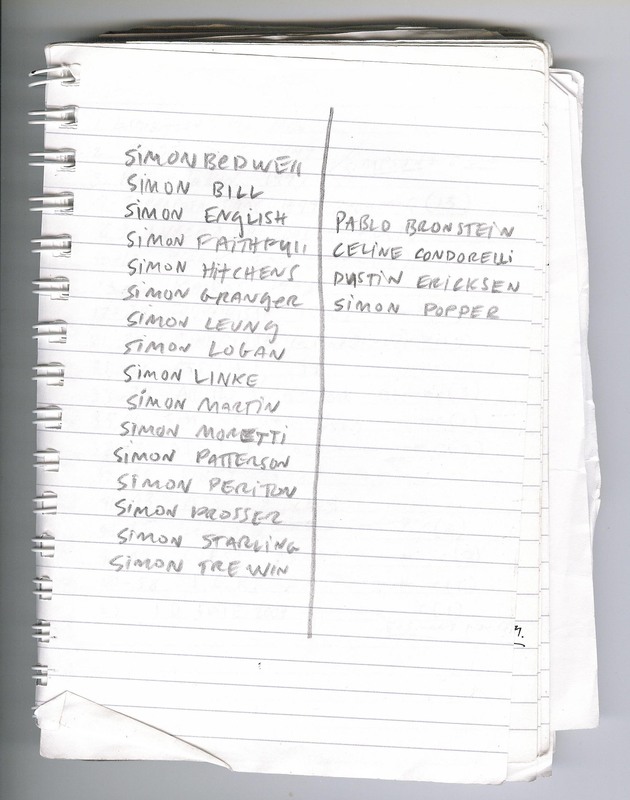 Dustin Ericksen; Simons Not In The Show [after Mitchell Syrop] , 2005. Vinyl, wire. 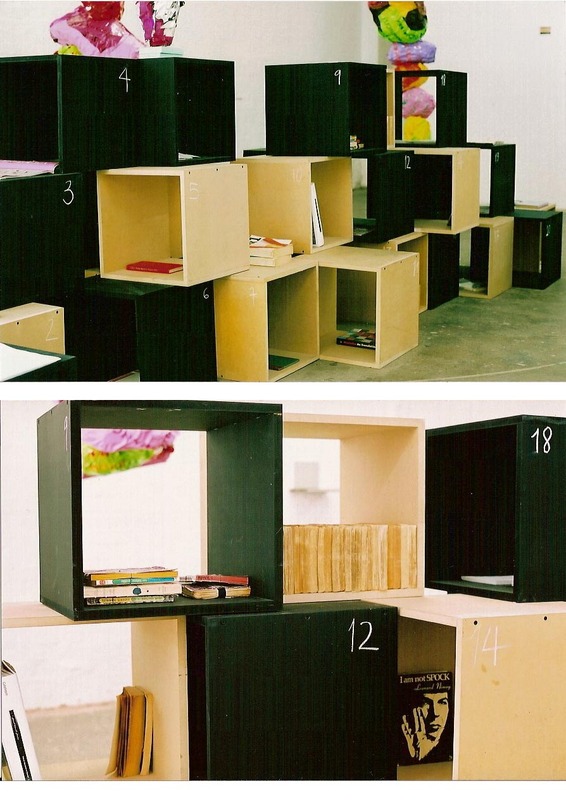 The unpainted boxes contain books and items that the participants frequently refer to in their practices. 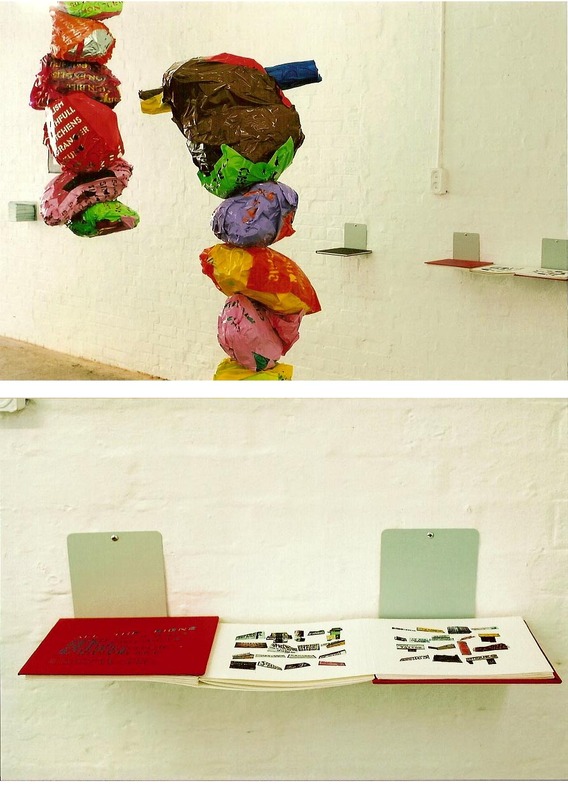 The black boxes contain artworks made by the participants. 1 . List of Works. 2 . Pablo Bronstein; Tacitus . 3 . Dustin Ericksen; Grundrisse , 2004-? (unfinished). (Triplicate book) Ink, carbon paper. 4 . Dustin Ericksen; untitled, 2004. (Project for Art Review ) Magazine. 5 . Celine Condorelli; The Economist: Pocket World in Figures , 2004. 7 . Pablo Bronstein; Privately printed book documenting a book once owned by Diane de Poitiers. Undated (1916?). Celine Condorelli; How Things Work , Vols. I & II. 8 . Dustin Ericksen; All The Signs I , 2001. (Sculpture) Vinyl, Styrofoam. Celine Condorelli; Fluffers (pack of cards. A project by Robert Johnston for Flatpack 001, London). Celine Condorelli; 100 things to do when you're stuck (from Daniel Libeskind's office, Berlin). 9 . Simon Popper (mailed to Pablo Bronstein); Jean Cocteau: Les Enfants Terribles, 2004. Simon Popper (mailed to Pablo Bronstein); Jean Cocteau: La Machine Infernale , 2005. Simon Popper (mailed to Pablo Bronstein); Jean Cocteau: Les Parents Terribles , 2004. Simon Popper (mailed to Pablo Bronstein); Jean Cocteau: Opera/Suivi de Plain-Chant , 2004. Simon Popper (mailed to Pablo Bronstein); Jean Cocteau: Oedipe-Roi/Romeo et Juliette , 2003. Simon Popper (mailed to Pablo Bronstein); Jean Cocteau: La Machine Infernal/Piece en Quatre Actes , 2004. Simon Popper (gift to Celine Condorelli); Marguerite Duras: C'est Tout . Simon Popper (gift to Celine Condorelli); Samuel Beckett: L'image. 10 . Dustin Ericksen; Shah Biennale Exhibition Catalogue. Dustin Ericksen; Homer: Ilyad . Pablo Bronstein; Aeschylus: The Oresteian Trilogy . 11 . Celine Condorelli; Muntadas: On Translation . 12 . Simon Popper (gift to Celine Condorelli); Samuel Beckett: Soubresauts . 14 . Dustin Ericksen; Leonard Nimoy: I Am Not Spock , 1974. Dustin Ericksen; Soyo Dralon SY-P4I875P (Platinum Edition) User's Manual. 15 . Simon Popper; Marcel Proust: A La Recherche du Temps Perdu, various edition dates. Nrf Gallimard Edition. (53 books collected between 1997 and 2005)[Continued from box 13]. 17 . Celine Condorelli; Raymond Queneau: Exercises de Style . 18 . Pablo Bronstein; Quintus: The Fall of Troy, 2003. Pablo Bronstein; Quintus: The Fall of Troy, 2003. 19 . Dustin Ericksen & Mike Rogers; A Caltech Art Space 1999-2001, 2003. (Prototype for editioned catalogue). Pablo Bronstein; Quintus: The Fall of Troy, Vols.I-IV, 2003. Pablo Bronstein; Quintus: The Fall of Troy, Books 1-7, 2003. Pablo Bronstein; Quintus: The Fall of Troy, Book 13, 2003. Pablo Bronstein; Quintus: The Fall of Troy, (blue cover) 2003. Pablo Bronstein; Quintus: The Fall of Troy, (A4 format) 2003. 21 . Dustin Ericksen; 100 Reviews Backwards , 2002. Matthew Arnatt, Ed. Pablo Bronstein; Simone de Beauvoir: Must We Burn De Sade ? 1953. Pablo Bronstein; A History of books printed by the Institute of Pataphysics. 23 . Dustin Ericksen; All The Signs II , 2001. 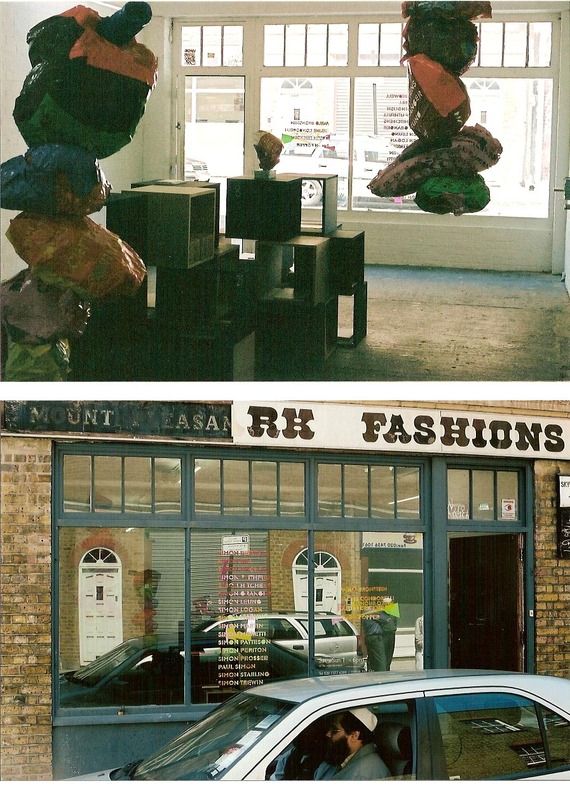 (Sculpture) Vinyl, Styrofoam. 24 . Pablo Bronstein; Quintus: The Fall of Troy , (fly cover) 2003. 25 . Dustin Ericksen; Grundrisse , 1998-2002. (Notebook/drawings in book). Tippex, ink, office documents, photographs. 26 . Dustin Ericksen; American History Library , Volumes I,II,III. 28 . Pablo Bronstein; Marcel Broodthaers: Catalogue of Books . 29 . Celine Condorelli; Georges Perec: Species of Spaces and Other Pieces. 30 .Dustin Ericksen; Simian's Way (study), 2003. 31 .Dustin Ericksen; sketchbook, 2003 - present.